When your home hits the market, you know showings of it are on the horizon. But how do you prepare your house for these visitors? The goal is to help those buyers imagine themselves living in the home. Here are some tips for home staging. 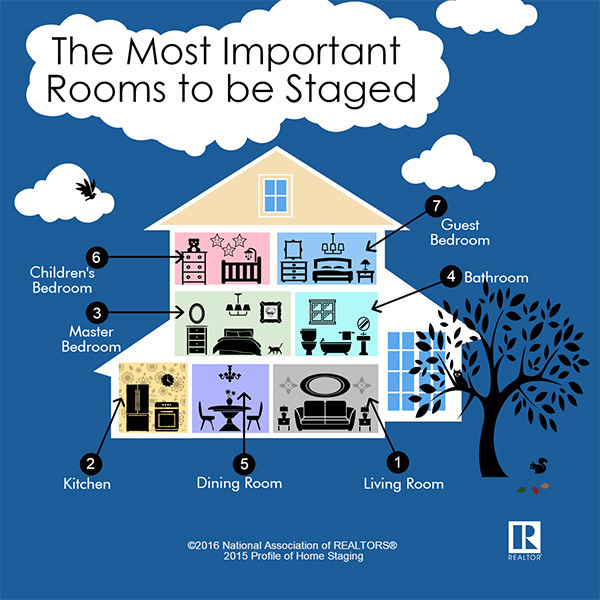 According to the National Association of Realtors, the most important rooms to stage are the living room, followed by the kitchen, master bedroom and bathrooms. Keep only essential furniture – typically a sofa and loveseat, coffee table, rug and TV. Fewer pieces helps the space feel larger. Fix any light switches, curtain rods, etc. that needs fixing. Mirrors are one of a home stager’s favorite tools. They create the illusion of more space! One budget-friendly way to boost the look of your kitchen is to paint those cabinets. A white finish instantly modernizes dark or oak wood cabinets. Also update the cabinet hardware. Maybe switch those basic knobs to modern, chrome handles. Replace those dirty drip pans under the burners on the stove. They’re cheap and really help out that “clean factor” you’re going for. Clear off all the magnets, photos or notes on the refrigerator. Clear all surfaces of your toiletries. Your brushes, soap (unless it’s in a nice dispenser), q-tips…everything. Remove the covers from light fixtures and the exhaust fan…then wash, dry and replace. Fix leaky or dripping faucets. This screams “house needs work”…the last thing you want. Dress up the bed in sheets, a duvet and pillows that coordinate. If you don’t have a headboard, invest in a cheap one to make the bed look more elegant. Use accent pillows to add bits of color and pattern, but don’t go overboard. Three is enough. In almost any room, add a potted plant or a fresh bouquet to make the space come alive and add instant color. The goal is to help buyers imagine themselves living in your home…and it doesn’t need to cost a fortune: you just need to get 90% of your belongings in storage and make some small, simple changes.